In a recent with 50 Cent on the Breakfast Club, I heard 50 talk about Ester Dean and her phenomenal songwriting skills. Ester Dean has written for some big names in the music industry such as Rihanna, Keyshia Cole, Mary J Blige, Kelly Rowland and Britney Spears - just to name a few (because the list is long!). 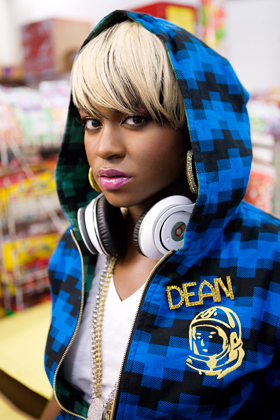 Ester Dean is set to release her first official album in 2013 entitled Story Never Told. The singer has released a single "I Can't Make You Love Me", a remake of Bonnie Raitt's '91 hit - singer Tank has also done his own remake of the song. Nothing is ever better than the original, but I like both Ester Dean and Tank's covers to the song.